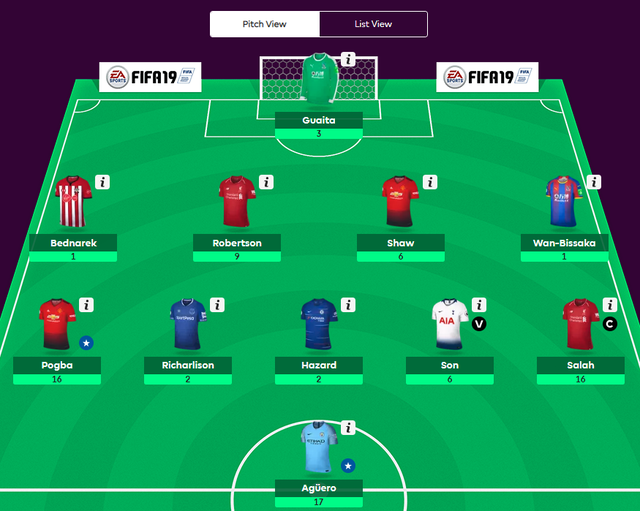 It's been another competitive week in Fantasy Premier League, with some high scores across the board following an average gameweek points haul of 57. Joel Tesfai remains top of the AFC Bournemouth fan league and recorded an impressive gameweek score of 79. Luke Shaw made his mark at the back, picking up six points for his clean sheet against Fulham. Further up the pitch, Paul Pogba’s star-studded display saw him total 16 for his two goals, which consequently saw him pick up three bonus points. Son also featured in Joel’s midfield, finishing with a score of six after his goal. Up top, Sergio Aguero’s hat-trick against Chelsea meant that the striker also reached double-figures for the weekend, scoring 17. Following on from Joel was Gurbanmyrat Myradov, who is second in the Cherries fan league with an equally-impressive gameweek score of 80. Ben Foster’s ten points in goal kick-started proceedings, while Pogba again proved popular higher up the pitch. Raheem Sterling was the standout performance, though, picking up a total of 18 points for his two goals and assist against Chelsea. Nevertheless, the highest score in the fan league this week came from Ian Woodhouse, who finished on 125. The likes of Pogba and Sterling featured again, with Ashley Barnes’ goal and assist saw him record 11 points for Ian’s team. Aguero accompanied the Burnley man up top and the decision to captain him was indeed a wise one, the Argentine finishing on 34 points.